[S33] Prince Edward Island Baptism Card Index, 1721-1885, Public Archives and Records Office of Prince Edward Island, Charlottetown, Queens Co., Prince Edward Island. Online FamilySearch.org. [S201] Prince Edward Island Baptismal Index, online www.gov.pe.ca/archives, record at St. Columba RC Church; father Alexander Campion, mother Margaret Brian (sic); record book 2, page 135. [S34] Prince Edward Island Marriage Registers, 1832-1888, online FamilySearch.org, Patrick James Donovan and Margaret Alice Campion. by Banns, witnesses John Campion and Eliza. Campion; Rev. D.F. McDonald [clergyman at St. Mary's] officiating. Prince Edward Island Marriage Registers, 1832-1888, Marriages 1871-1878, page 314 , image 160. [S34] Prince Edward Island Marriage Registers, 1832-1888, online FamilySearch.org, Patrick James Donovan and Margaret Alice Campion. by Banns, witnesses John Campion and Eliza. Campion. [S17] 1880 U.S. Federal Census. James (31), rock blaster, b. Canada, parents b. Ireland, unemployed 4 months in the census yr; Alice (20), keeping house, b. and father b. Canada, mother b. Ireland; Nellie (1); John Cronan (26), brother-in-law, stone cutter, unemployed 3 months in the census yr; Margaret Cronan (24); John Campion (23), brother-in-law, grocery clerk. [S151] Trow's New York City Directory, Vol. XCV, for the year ending May 1, 1882 (11 University Plave, NY: The Trow City Direcory Company, 1882), [James] Patrick Donovan, stonecutter, home 525 W. 46th Street (p. 417); John Cronin, stonecutter, home 592 11th Avenue (p. 340). [S423] U.S. City Directories, 1822-1995, online Ancestry.com, Donovan James, blaster, h 531 W. 48th. Trow's New York City Directory, vol. CI for the Year ending May1, 1888, p. 496, img. 502. [S31] 1905 New York State Census. James P. (55), b. Canada, in U.S. 37 yrs., Supt. Laborers; Alice (45), b. Canada, in U.S. 26 yrs; both citizens. Note: while the data column asks for number of yrs. in the U.S., it appears that the entries are for age when entered U.S.
[S8] 1910 U.S. Federal Census. James C. (52), b. and parents b. Canada, imm. 1866, natlzd., contracting superintendent; Alice C. (50), b. and parents b. Canada, imm. 1880, 9 children, 5 living; Marion (21), Anna (13), John E. (grandson, 2); Michael Berry (33), b. Austria; Nelly D. (30), b. Canada. [S11] 1920 U.S. Federal Census. James (67), contractor); Alice (59); both b. and parents b. in Canada, imm. 1879, natlzd. 1888. [S7] 1930 U.S. Federal Census. James P. (81), married at 27, b. and parents b. Canada), Alice (70), married at 17, b. and parents b. Canada; in household of Michael Ward. [S248] Polk's City Directory R. L. Polk & Co., Mt. Vernon, NY, 1937, p. 141. [S2178] New York, Death Index, 1880-1956, online Ancestry.com. Year 1947, sh. 1386, img. 376/1624. Alice Donovan, d. New Rochelle 1 Apr 1947, age 87; Cert. No. 26250. [S44] "Mom's Stories," (MS; Crestwood, New York); Collection of Vincent W and Donna F Hartnett. [S1461] New York, New York City Births, 1846-1909, online FamilySearch.org, Margaret Alice Donevan [sic], b. Manhattan NY 18 Jan 1884, dau. of James Patrick Donevan and Margaret Alice Campin; Cert. No. 387301. [S1461] New York City Births, 1846-1909, online FamilySearch.org, Mary Donevan [sic], b. Manhattan NY 29 Jun 1885, dau. of James Patrick Donevan and Margt. Alice Campin Donevan; Cert. No. 430714. [S150] Genevieve Fagan Genealogy, online http://familytreemaker.genealogy.com/users/f/a/g/…, John James Donovan (son of John Lawrence Donovan and Mary (May) Doty), was born January 12, 1908 in New York, and died August 28, 1979 in Greenwich, CT. He married (1) Mary Noone Donovan. 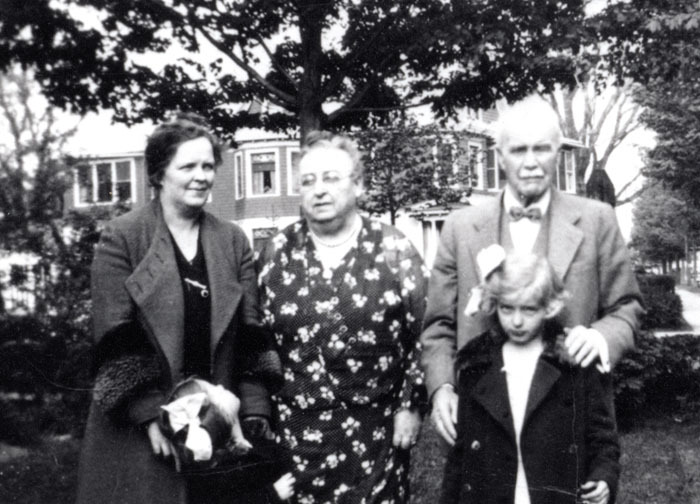 He married (2) Genevieve Roche on October 10, 1925, daughter of James Francis Roche and Anna Angela Rose.